For part one of my review, see here. Part two here. (Amazon link to the book.) I wanted to touch on a few issues before finishing up with Carroll. One of the difficulties in Gospels studies is determining what situation the first readers were facing—a situation that may have occasioned the writing or is simply implied by it. It seems to me that some scholars are too confident in their reconstructions of the original audience, and such reconstructions tend to color, even if slightly, their interpretation. I would like to see more care taken by Carroll (and others in general) in presenting the evidence for any such claim and not going further than it allows. On the whole, Carroll does not often overstep the evidence. In fact, one reason I commend the commentary is because of Carroll’s careful, balanced approach. His literary and theological sensitivity to the text is also commendable. 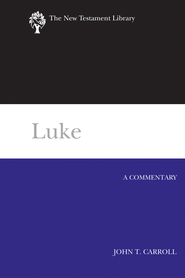 I cannot say Carroll makes a significantly original contribution, but he provides a readable, up-to-date, semi-technical commentary on the Gospel of Luke, accessible to students and pastors. Update: Thanks to James (below) for reminding me to comment on the unity of Luke-Acts issue I mentioned in an earlier part. I think Carroll (he’s not alone!) assumes too great a unity between the two, Luke and Acts. I see a lot a unity, too, but I’m speaking of a view that supposes the author has pre-planned the whole project, even redacting parts of the Gospel in view of Acts (at some stage), etc. I certainly think that, given the evidence we have, such a position is possible, but I am more comfortable with simple shared authorship (for a recent discussion, see Andrew F. Gregory and C. Kavin Rowe, eds., Rethinking the Unity and Reception of Luke and Acts [Columbia: University of South Carolina Press, 2010]). I take it that the bit on the unity of Luke-Acts is now going to be in part four. Looking forward to disagreeing with it! James, thanks for reminding me. I’ve updated the post with a note about the unity issue. Feel free to further the discussion!